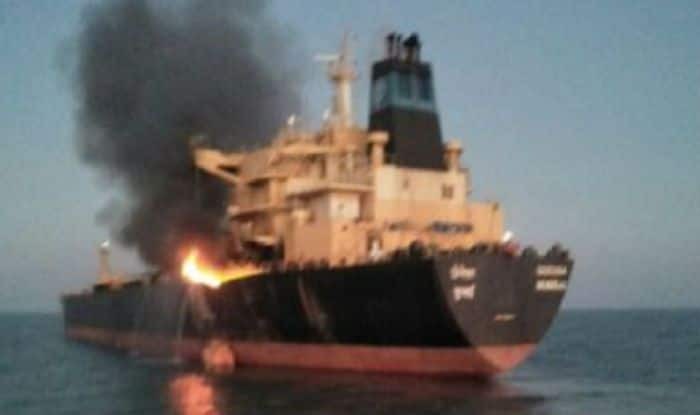 Moscow: At least 14 people have died in a major fire that broke out on two Tanzanian-flagged ships, both carrying Indian and Turkish crew, in the Black Sea, Crimea Prime Minister Sergei Aksyonov said on Tuesday, triggering fears that the fatalities may include Indians. The Crimean and Russian authorities, however, did not identify any of the victims in the Monday night horror near the Kerch Strait that separates Crimea and Russia. The Mumbai-based National Union of Seafarers of India told IANS that they were aware of the casualties but had no information about how many Indians, if any, had perished. Preliminary information said the fire erupted due to the failure of a pump being used to transfer fuel between the two vessels – Candy and Maestro – in violation of security regulations, Russian state news agency TASS reported. The two ships had a total of 32 crew members including Turks, Indians and a Libyan intern. According to TASS, Candy had a crew of 17 _ eight Indian nationals and nine Turks while the Maestro carried seven Indians, seven Turks and the Libyan. “… We currently have information about 14 dead sailors… Other sailors have not been delivered to hospitals yet,” the Crimean leader said. The Indian embassy in Moscow was in touch with the agencies in Russia to get more information, the External Affairs Ministry said in Delhi. A spokesman from Russia’s Federal Agency for Maritime and River Transport said that 12 people had been rescued and there were no chances of finding any more survivors. “The fire on ships continues… It will not be extinguished until all the gas burns out,” the spokesman said. Officials said that Russian rescuers were trying to reach sailors who jumped into the waters to avoid the fire. Maritime traffic was not affected by the incident and navigation through the Kerch Strait is still open, the Director of the Crimean Sea Ports said. Authorities in the Crimean city of Kerch said they were ready to receive the victims. The crew members were sailing in “neutral waters” in the Black Sea when the incident occurred, reports said. The strait holds strategic importance for both sides. It is an important economic lifeline for Ukraine that allows ships leaving the port city of Mariupol to access the Black Sea. It is also the closest point of access for Russia to Crimea, a peninsula Moscow annexed in 2014.